Does the World Really need more Golf Courses? Yes I know today's post was supposed to be about oceans and they are definitely in the news, so much so that I am still reading about them and haven’t had time to write. While you are waiting for that one, I‘m just going to have another cheap shot at Golf Courses which are not only proliferating in many parts of the world, but are also appropriating the commons. I might have to change my job description from Practising Geographer to Professional Whinger* [students not familar with this term are advised to look at the end of the post]. Billionaire property developer, Donald Trump is not a happy camper. 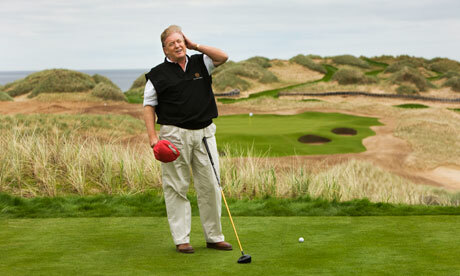 He wanted to build another large golf course next to one he has already built on the Scottish Coast near Aberdeen, but the site is earmarked for a wind farm. Now Donald has threatened to use his wealth to support groups which oppose wind farms and use any legal means at his disposal to stop it. "Decisions over Scotland's energy and economic policy are for the democratically-elected government of Scotland, not billionaire American businessmen sitting in New York"
Now I am all for rich people getting a bit of exercise and fresh air, some really do look as if they need it, just like the rest of us, but do they really need to do it by setting up their exclusive little clubs in some of the last few remaining wild places, especially when this is much needed to put us on a more sustainable course. Over the water, the Irish are also fighting the establishment of a Golf Club at the Giant’s Causeway, a notable historic site and tourist attraction in Northern Ireland. The following quote comes from the Care2 site. “The Giant's Causeway, a stretch of bizarre volcanic rock formations, is one of Ireland's top tourist attractions. Situated at the very top of Northern Ireland, thousands of tourists a year visit the Giant's Causeway for the wild scenery and the mysterious hexagonal rocks. In Australia, things just aren’t going as they should for our own überrich underclass either. They too have been throwing their not inconsiderable weight around because they have not been getting things all their own way. Having used their influence to overturn the mining tax and trying to overturn the carbon tax, they are taking out full page advertisements and taking much editorial space in what used be our newspapers to attack our TreasurerWayne Swan for pointing out that they were greedy “rent seekers” who put their own interests ahead of the best interests of the country. They claim they were only exercising their democratic rights like any other citizen. I suppose it’s no use pointing out that not too many other citizens can make enormous political donations or buy their own newspapers. Most other citizens also pay their fair share of taxes. Judging by the comments not too many people have fallen for it either. Might I suggest that we all drop a note of support to Wayne Swan, recently voted the World’s Best Treasurer for telling it like it is. Here’s the address.